The "front" door on the side of this small hut fooled me with its open sign, making me wonder if it was connected to a dining room in the main building. On this sunny winter day I could not squint and see through the windows, and thus made the mistake. I found Amanda at her griddle, busy making the pupusas she is famous for, and scrambled to explain my error. Needless to say, this is a strictly take away operation, but they do have a small table and a few chairs nearby for nice weather or optimistic winter days like this. 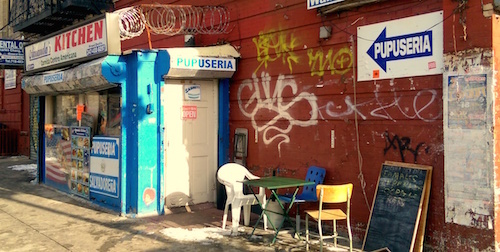 The little hut used to be a hot dog stand, and sits directly across the street from Maria Hernandez Park in Bushwick. The menu has about five or six options on it, but the lady before me and I kept ordering things that would require a wait. Her and I both ended up settling for chicharron y frijoles and queso y frijoles varieties. 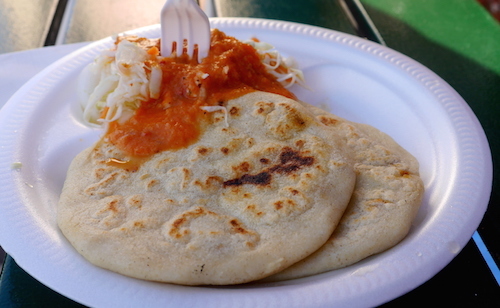 All options here are $2 per pupusa. These thick corn tortillas are of course stuffed with their ingredients, and served with a small side of chopped cabbage and vinegar which is covered in a slightly spicy sauce, giving you the opportunity to create differently mixed bites. I hesitate to call this curtido because it is not fermented. It is fairly obvious that Amanda has been in this game for a while, as the pupusas are excellent, especially for this part of the city. If you want your summer pupusas in a park and are tired of the scene in Red Hook, this will be a very nice alternative.